Does your child love sea creatures or swimming? Then an Under The Sea Party could be the perfect choice for your child’s next birthday party. The key to planning one of the coolest birthday parties is in the detail. This post will provide you with ideas for invitations, decorations, activities, food and treat bags. Before planning your invitations, decorations and activities, you’ll need to choose a location. An Under The Sea Party is so fun because the theme allows for so many location options. If your city has an aquarium, they likely have a party room for rent plus the kids can have fun exploring the aquarium during the party. Perhaps you can hold the party at a pool and rent a room after swimming for food & gift opening. If the weather cooperates, you could hold the party at an outdoor pool. If you’d rather have the party in a more private setting, you could set up a kids pool or two in your own backyard and host a BBQ. There are so many possibilities! I planned my son’s first birthday party as an Under The Sea Party and held it at a pool. Click here for pictures of his special day along with more fun ideas. So many fun invitation ideas to choose from! The first birthday party invitations noted below have a unique squiggle shape, vivid colors and provide up to 11 lines of personalization. If you don’t have all of the party details sorted out just yet or if you’d prefer to write them yourself, there are also fill in invitations available. Want to add a finishing touch to the invitations? Then add some cute return address labels to the envelopes. With so many Under The Sea Party options to choose from, you’re sure to find something that’s the perfect fit for your party. A personalized garland would be a nice added touch above the cupcake table or behind the birthday boy or girl’s seat (perfect for pictures!). A banner is a great way to welcome the guests to the party as they arrive. For topping tables, you could use disposable plastic covers in blue or you could order something more decorative that fits in with your theme. Table centerpieces are easy to setup and add a lot to a food table. You could even visit your local dollar store and pick up a few sand molds to set out on some tables. They usually have a lot of cute designs. What’s a party without balloons, right?! Balloons are always a fun decor item. Swimming: Whether it’s at a local indoor pool, a public outdoor pool, a beach or in your own yard, swimming is a fun activity for an Under The Sea Party. You could provide a few pool toys such as snorkels and beach balls. Fishing: Set up a small kids pool in your yard and fill it with small sea creature bath toys. Using a small fish net, have each of the children take turns seeing how many sea creatures they can catch in a set amount of time. Ball Pit: Turn a small kids pool into a ball pit for the kids to play in. Bean Bag Toss: I’m hosting an Under The Sea Party for my son’s birthday this year. 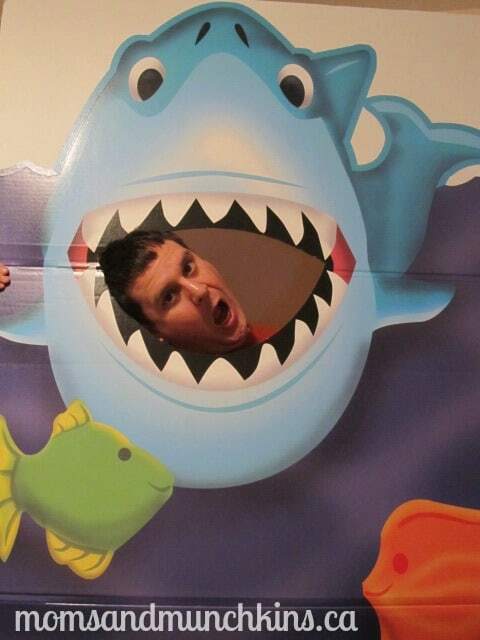 We ordered a large shark cut-out as a photo opportunity (we’re having each guest get their picture taken in the shark’s mouth and will send these pictures along with the thank you cards) and as a game as a bean bag toss. We ordered this from Shindigz.com. For an outdoor pool party, a BBQ would be an excellent choice. For an indoor pool party, it would be convenient and easy to order in food so you have less to worry about and carry into the facility. For an Under The Sea Party at home, bite-sized food items are always popular with the kids. Easy items that will please most of the guests would be sandwiches in the shape of fish (using fish cookie cutters), small cups filled with goldfish crackers, fish & chips or submarine sandwiches. One of the most fun parts of planning a party is deciding what to include in the treat bags. 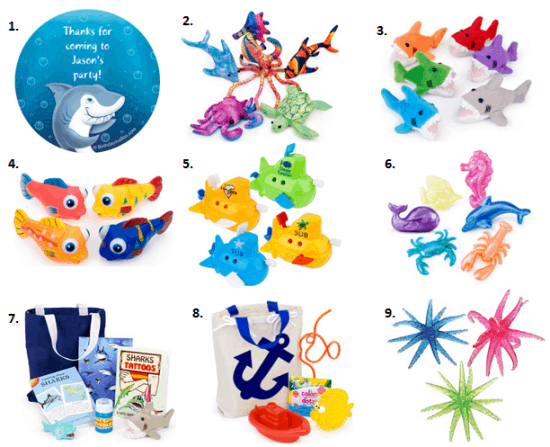 There are so many options for an Under The Sea Party! Have Fun & Happy Planning! 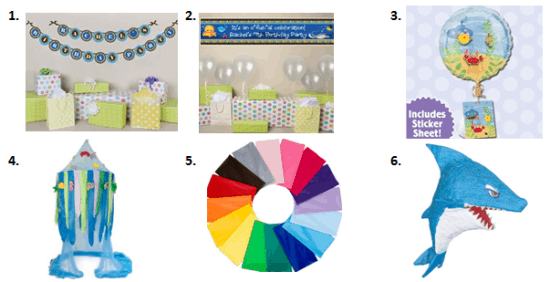 Don’t forget to check our Birthday Party page for free birthday printables, more theme ideas, planning tips and more! We’re always adding new ideas for parties! Stay updated on the latest by following us on Facebook, Twitter, Pinterest and Bloglovin’. *Disclosure: I am part of the Amazon.com, Big Dot of Happiness, Tiny Print Inc., My M&M’s and Birthday in a Box affiliate programs.